It has been a long while since I last dined at Crystal Jade Paragon. To begin with, there is a new chain of restaurants under the Imperial Treasure group that is competing head-on with the Crystal Jade group and has taken a great deal of business from Crystal Jade. 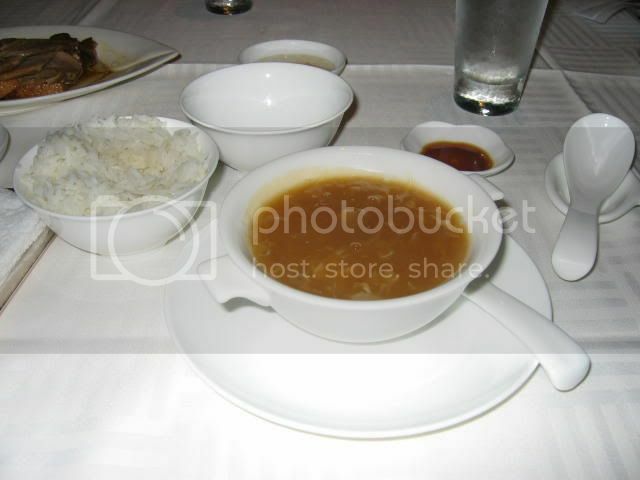 Typical of Singaporeans, most people will want to try a new place and to be fair, the food is good, service can be excellent, depending on how regular a customer you are and prices are reportedly 10% cheaper at the Imperial Treasure outlets. This has obviously affected the business of the Crystal Jade group. Most of the staff at the Imperial Tresure outlets are familair faces, having migrated from the Crystal Jade outlets. It appears that there has been a great amount of poaching but that is common here. There are only so many regulars in these restaurants and they are pretty close-knit. If you capture the business of one group, you probably have got the business of the rest. Some time back a friend was charged a very hefty sum for two tables and the word went around. Before long, most of the frequent diners were avoiding the place and worse still, this was the time Imperial Treasure was opening their outlets. Like true Singaporeans, everyone wanted to sample the new restaurants and a great deal of business was lost to the new group. Owners should take note and learn from the experience of others. In another case, a Western-style eatery billed another friend $200+ for water, and when the host called the next day, the owner's reply was, "I charged the next table even more for the water." That was the death-knell for the restaurant. It was only a matter of time before the demise of the place. Restaurant owners who refuse to serve PUB water and only serve chargeable Pelegrino or Evian should take note. Back to the revisit of Crystal Jade Paragon. As there were only 3 of us, we decided to order some dishes to eat with rice. 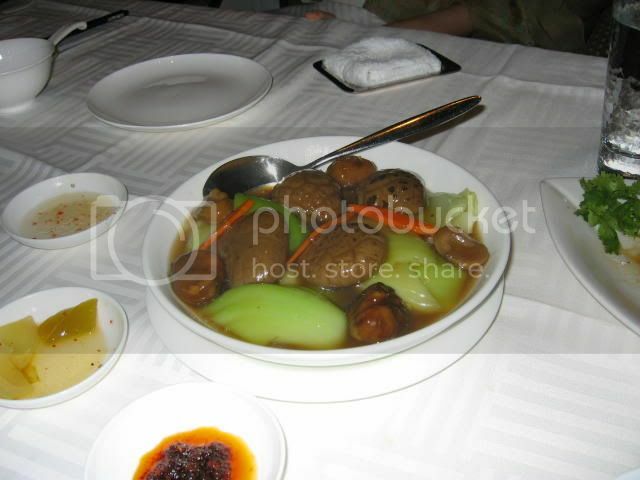 First was their signature dish of sliced Teochew Goose with bean curd with 3 bowls of rice. Nothing new here except the sharksfin soup that came out next. The somewhat gooey sharksfin soup has to be eaten before it gets cold and by the time it was consumed, the rice had gone cold. A long wait followed before the next dish was served. An old favourite, green mustard with chestnuts and mushroom. Nothing to write home to mum about. The mushrooms were big and soft but the gravy was somewhat starchy. This came with 3 new bowls of hot rice as the first 3 bowls had gone cold. 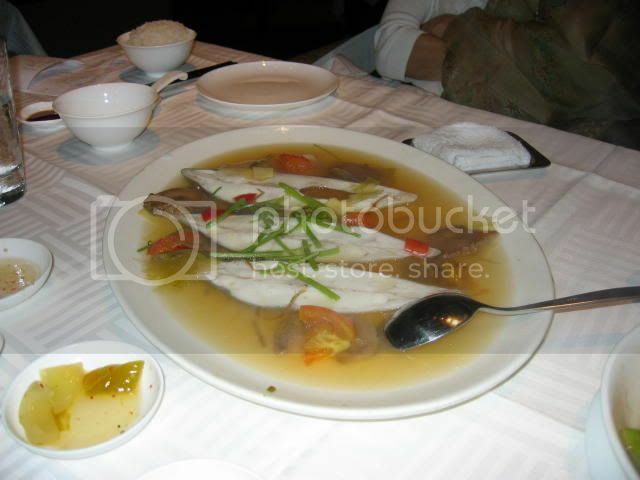 As recommended, we ordered Teochew steamed pomfret. What emerged was something we had never seen before. There were 3 slices of pomfret swimming in sauce. 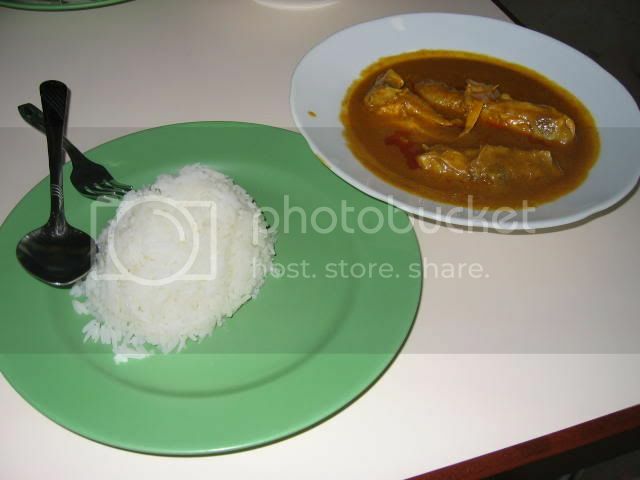 No head or tail but just 3 slices of pomfret, almost like what you would find in Penang-style Assam curry fish. Incredible! 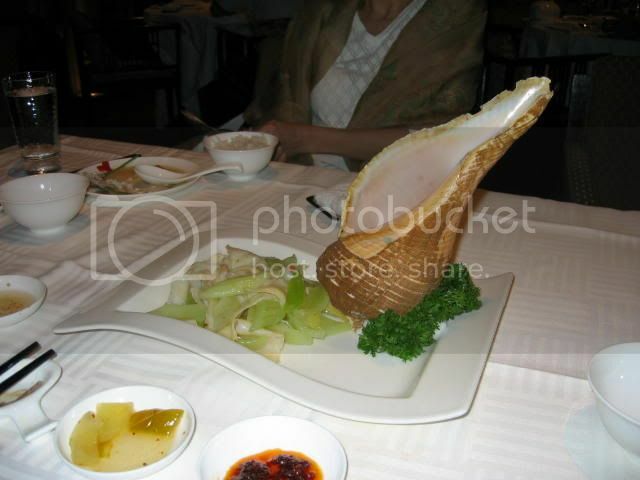 As the fish was not fresh, another order recommended was welk fried with celery. 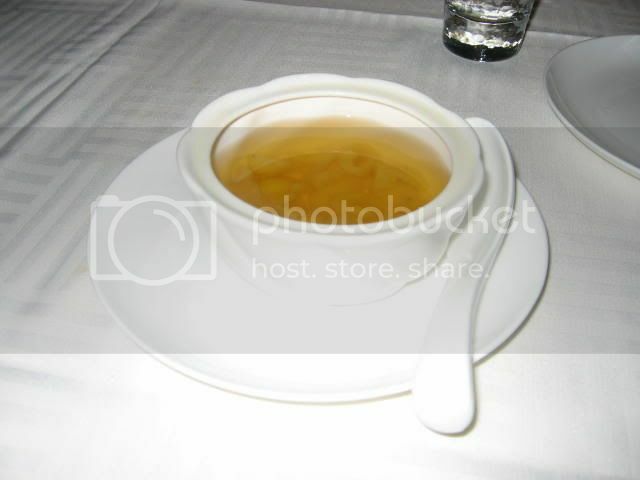 This was not bad and we rounded off the meal with one bowl of gingko nut soup as dessert. Since I have a sweet tooth it was fine by me but the 2 ladies decided it was too much work the next day at the Gym and left the calorie-laden soup alone. There was also a complimentary plate of fruits consisting of papaya, watermelon and honeydew. The bill for the 3 of us for the food served with PUB water was just over $400. Value for money? Your call. 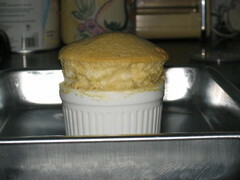 It's always been said that soufflés are one of the most difficult and challenging desserts for amateur cooks to attempt. However, it's also always been said, by those in the know, that soufflés are really not that daunting, given how much can be prepared beforehand. Since all soufflés are a mixture of a savoury or sweet base incorporated into egg whites, only the actual beating of the eggs needs to be done at the last minute. Having personally seen soufflés being prepared in a restaurant in a matter of minutes, I was inclined to believe that their reputation for ruining many an inspiring patisseur's future was, dare I say it, overblown. The most important thing is keeping everything very dry and proper management of oven temperature. However, making them in a professional kitchen and at home are two very different things, as I discovered over the week. This recipe was originally intended to be an entry for Sugar High Friday: Liquer, but I discovered too late that my sister had polished off all the kahlua. Notes on ingredients: The actual recipe is huge, so this proportional one involves some odd measurements. You may need 3 eggs if the ones you're using are small, though. Also, this recipe serves 3 if you're using 3-inch ramekins; if you're using 5-inch ones, it'll only serve 2. 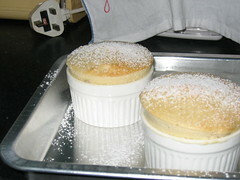 Before starting your souffle, butter your ramekins and coat them with sieved icing sugar, knocking out the excess. 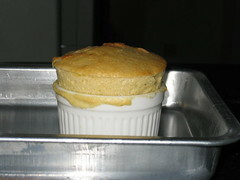 This will help your soufflés rise straight without the need for a collar. I'll show you the results later. The prepared ramekins can now be cling-wrapped and placed in the fridge. If preparing your soufflés in advance, you should also measure out the 30g of sugar and 80g of egg whites (should be about two or three whites), storing them in the refrigerator in separate containers for later use, saving lots of time. Restaurant tip. Now for the soufflé proper. It's going to sound complicated, but only because I'm trying to be as detailed as possible. 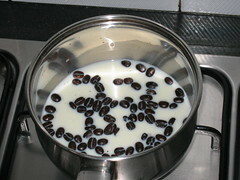 Boil your milk with the coffee beans, making sure the milk only just comes to a boil. Once that happens, turn off the fire and let the coffee beans infuse for a few minutes. 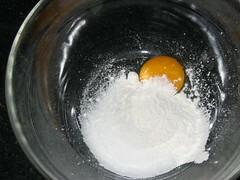 Add the 40g of sugar and flour to the egg yolks. 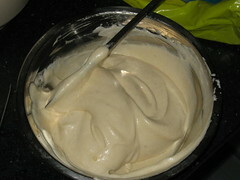 With a whisk, mix them till the mixture is pale and the ingredients are well incorporated. 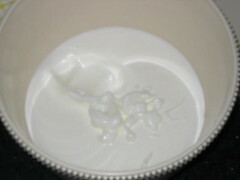 Your milk should have boiled by now, so strain the milk into your egg mixture. 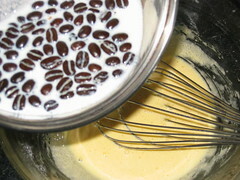 As you can see, I forgot to do this, so I spent five minutes picking coffee beans out of my sticky souffle base. Not fun. 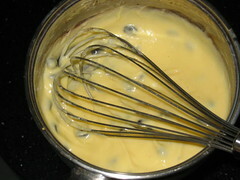 Pour the milk and egg mixture back into the saucepan, return it to the heat and stir till the mixture becomes yellow and thick, almost like porridge or dough, but without the coffee beans, of course. 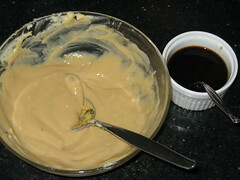 Dissolve one tablespoon of instant coffee in a little bit of water (you want the coffee strong), and add it gradually to your paste, until it turns a beige colour and smoothens to a thick, creamy paste. Now ideally you should cover this with a cartouche or some cling wrap to cool without producing any condensation, but if you're pressed for time you can proceed directly from here. This base can be stored for at least a few days, if you can keep it free from condensation. Any water would be bad for your soufflé. Basically, 80g of your soufflé base, 80g of egg white and 30g of sugar will make three, or two, soufflés, depending on ramekin size. The amount of soufflé base you have is slightly over 160g, so you can make six soufflés, but you'll need 80g more egg white and 30g more sugar for the second batch, which leaves you extra yolks which you can use for more soufflé, and so on. When it's time to prepare your soufflé, beat 80g of egg whites. If you're using the ones you prepared earlier and were waiting in the fridge, it would help if you took them out sooner to allow them to warm up to room temperature, but it's not crucial. The beating of the whites is crucial to the success of your soufflé, so you'll want them as stiff as possible. 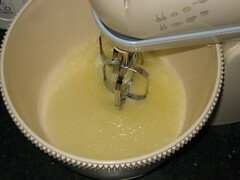 The whites should resemble puffy clouds or marshmallows, sticking to the beaters when you're done whipping. Sometimes cheaper home beaters can't quite manage this, but try your best. 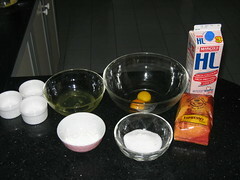 Cut a quarter of the beaten whites into your soufflé base and mix thoroughly with a spatula. Don't worry about deflating the whites because this is just to smoothen the mixture. Cut the rest of the meringue, in batches, and fold into the soufflé base. Try not to be too violent, as this time you don't want the whites to deflate, but at the same time make sure they're well incorporated, otherwise you'll end up with pockets of egg white in your soufflé, which can be a bit nasty. Scoop the mixture into the prepared ramekins and knock the base of the ramekins against the counter-top to let the mixture settle down and remove any air pockets. 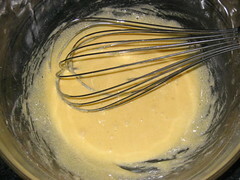 Using the spatula, skim away any excess mixture until the top is relatively flat, cleaning the sides as you go. 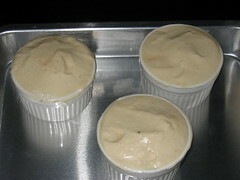 The soufflés are now ready to be baked and can be kept like this, refrigerated, for about fifteen minutes, after which they will not rise any more. An impressive height, though the top was a bit overcooked and the inside was somewhat dry as well. You can also see the bits of egg white that weren't mixed into the soufflé properly. Live and learn, I suppose. If you compare the two, the former was baked in a floured and sugared ramekin, while the latter wasn't, causing the dome shape and the rather pock-marked soufflé collar. I wish I could give a more accurate instruction, but I suppose the choice is yours, 6 - 8 mins at 180°C or 10 - 12 mins at 160°C, depending on whether you prefer height or doneness. Sprinkle with icing sugar when you remove the soufflés from the oven, and serve at once, as they will deflate in a minute or two. This entry is a little more convoluted and wishy-washy than I'd like it, but as I haven't quite perfected this recipe yet, I'm sure I'll make a few revisions as and when I tweak the process. Recently there's been a big to-do over the serving, or lack thereof, of tap water at various eateries. 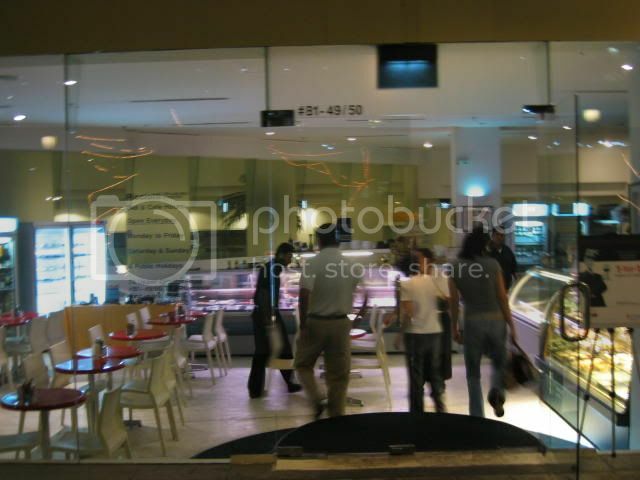 Leading the pack are Garibaldi's retail eateries, Menotti and Ricciotti. While I do think this policy detracts from the pleasure of dining at the restaurant, as luck would have it, we were invited to dinner at Ricciotti just the other day. The Riverwalk, where Ricciotti is located, is a sleepy building that also houses Just Steak, a steakhouse that seems to have been around forever, but may have seen better days. The best thing about Ricciotti, of course, are the desserts. They're more or less the same ones you get at Menotti, but I think they're made here, and they somehow seem a lot more attractive in Ricciotti's display case. 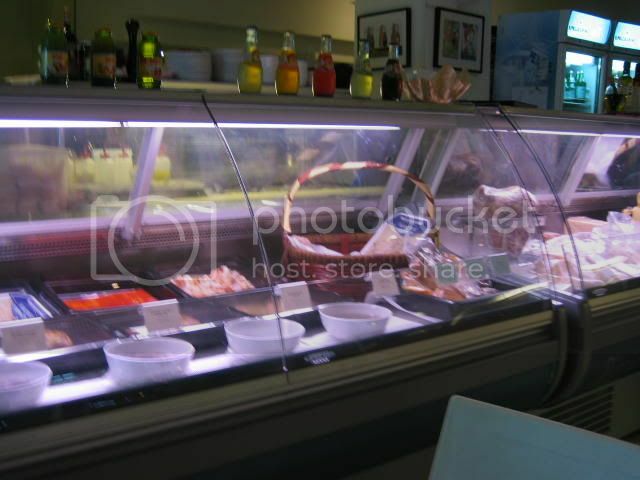 Being a cafe-deli, it's necessary that Ricciotti serve something other than dessert, so it also has various cold and warm appetisers as well as entrees. 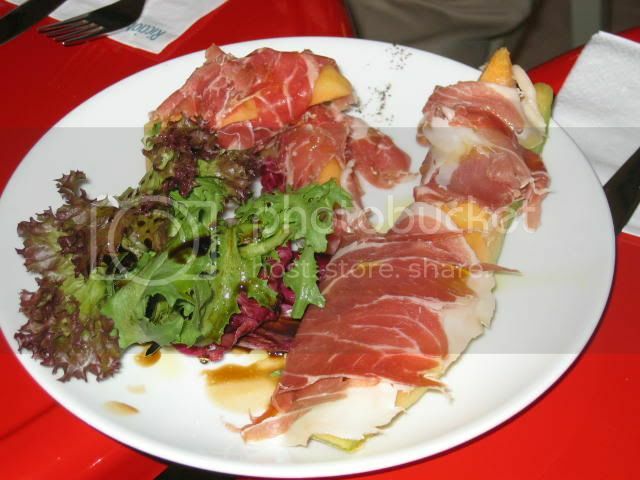 We had some parma ham and melon for starters ($12), which I didn't think was very good. The melon wasn't very sweet, and the ham was quite dry and stringy. Ricciotti, I had a feeling, was similar to Menotti in that its desserts are better than its cooked food, which is surprising, considering Garibaldi's high standards. I suppose there is some parable to be drawn here about parents and wayward children. We also shared some salad and grilled eggplant, basically rabbit food. 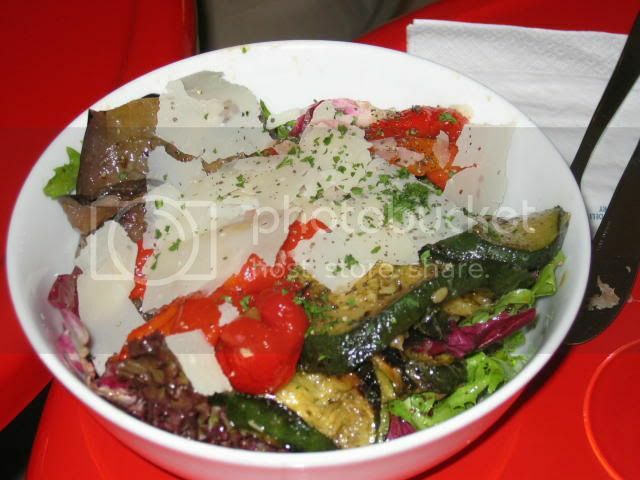 The salad was okay, nothing remarkable, and the eggplant was likewise unspectacular. I feel like grilled eggplant should be warm, rather than cold. The ones we ate were cold, and felt a bit limp. 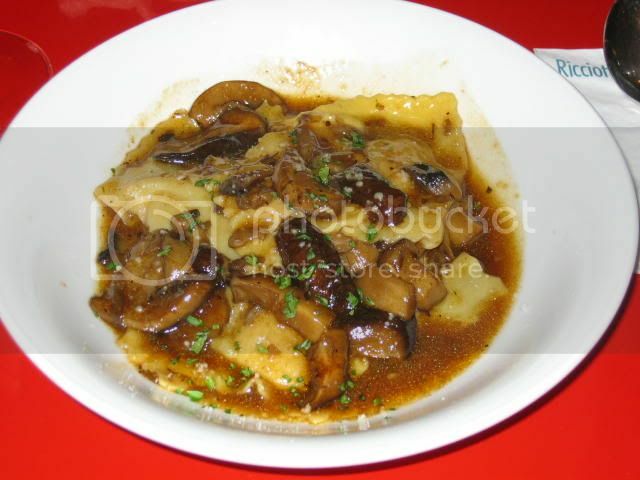 For mains, I had the veal ravioli in brown sauce ($16), which wasn't too bad, though the brown sauce was a bit salty and thin, rather like a stock than a sauce. But finally, on to the main event, the desserts. 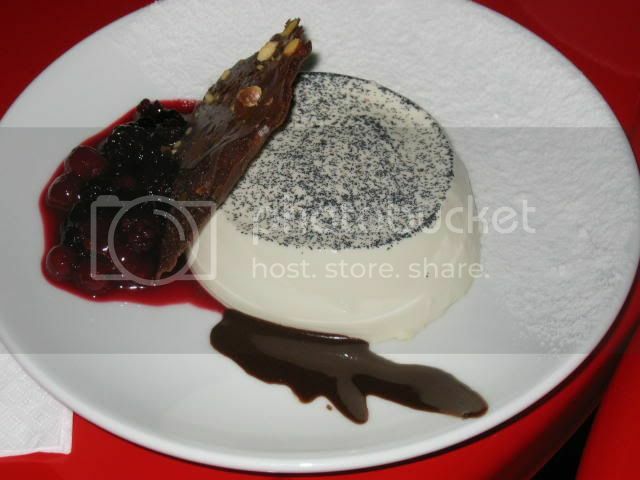 Panna cotta's ($6) becoming a mandatory order just to see how it measures up with what I can make at home. This one was pretty good, but there was a hint of something in it, perhaps fruit, that didn't quite agree with me. 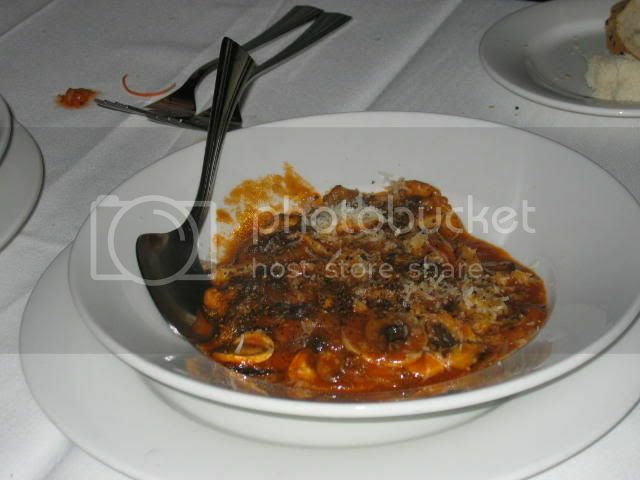 The sauce wasn't as tart as the one served at Menotti's though. 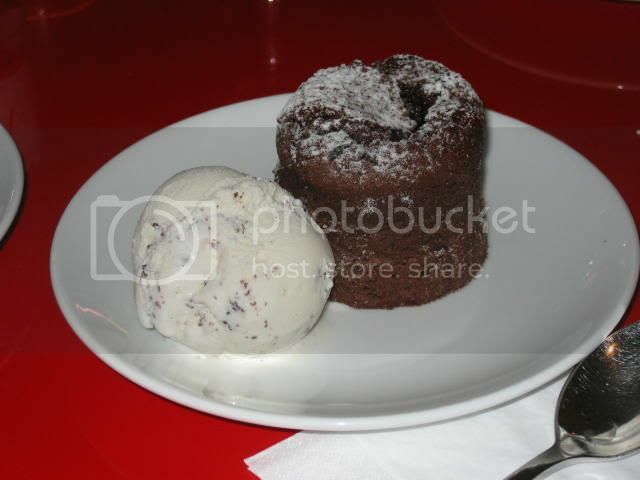 The soffiato is Ricciotti's take on the popular molten chocolate cake, served with vanilla chocolate chip ice cream. 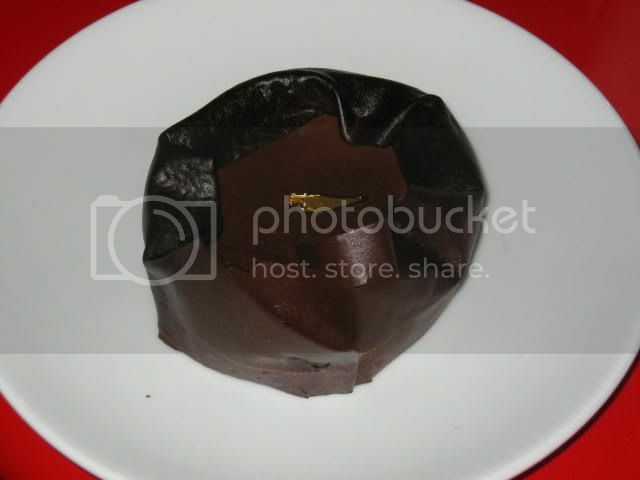 I don't like pre-baked chocolate cakes, because they tend to be just zapped in the microwave, which doesn't guarantee a molten centre. This one wasn't particularly molten, more moist than anything. The Crostata Cioccolato (basically a chocolate tart) was the best of the lot, but it would have been improved had it been totally chocolate, rather than having layers of raspberry jam in between. Ricciotti is not very conveniently located, as the Riverwalk is not easily accessible by either MRT or bus. Not the most convenient place to drive to either. Ambience is okay, casual and laid-back. Service was fairly agreeable, except for the charging for water bit. Another plus point for dropping by is that all desserts are on discount after 9pm. Overall: Nice place to hang out for dessert after one of those late-night walks by the river. After seeing it reviewed by Chubby Hubby, and hearing good things about it from Daniel, I decided to give Colbar a try. Tucked away just off Portsdown Road, Colbar's location reminded me of the time I tried to locate PS Cafe in Dempsey Road, another historical area with old colonial links. I'd never heard of Colbar before Chubby Hubby mentioned it on his blog, but I'm glad I found it - makes for a nice spot for brunch away from the hustle and bustle. 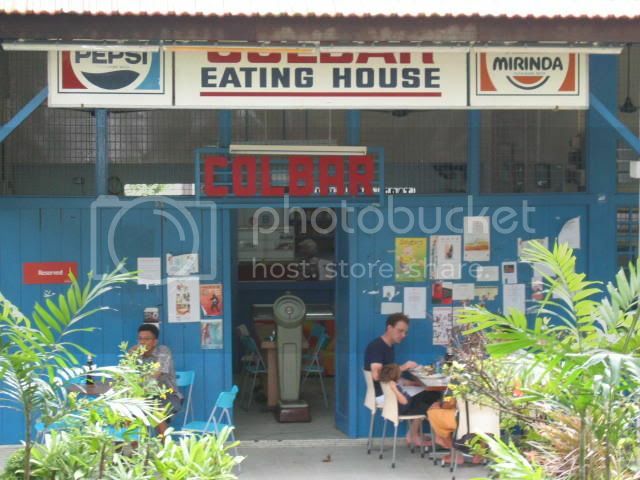 Lots of expats frequent Colbar, no surprise there, but increasingly I think more locals are catching on. Colbar has a rich colonial history, and pictures of its numerous soccer teams adorn the walls inside. RJC Economics students, keep a look out for a familiar face in many of the teams. I must admit I was rather disappointed with the chocolate milk shake ($3.50). It tasted like it came straight out of a Daisy chocolate milk packet, and for that price, wasn't very satisfying. 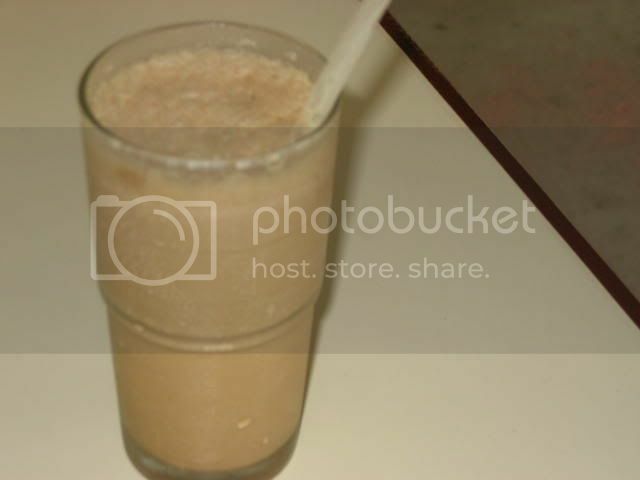 Might try the Milo shake the next time though. The chicken curry ($8) isn't that cheap, compared with hawker centres or food courts, but I suppose is a steal anywhere else. 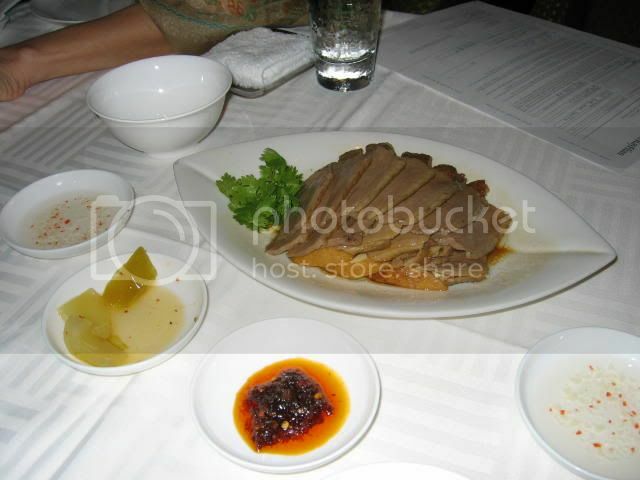 It's mild but quite rich, and the chicken pieces are small, so it isn't filling if you've a hearty appetite. Otherwise it's a fairly decent portion. No frills though, so don't expect any belachan or vegetables. Located on Whitchurch Road, Colbar does take some mapping to find, unless you're going with someone who's already been there. You probably have to drive too, because it's pretty far from an MRT. There's no air-conditioning at all, so it's probably best to go on a cool day or in the evening, though the eatery's quaintness and historical value make up for it somewhat. Service is limited to clearing tables and delivering dishes, so there's no service charge. Unfortunately there's not much else, either. The problem with going to try new restaurants is that the experience can be either good or bad. Now it's one thing to go to a restaurant and have a lousy time there, but it's quite another to go with high hopes and still have a lousy time. 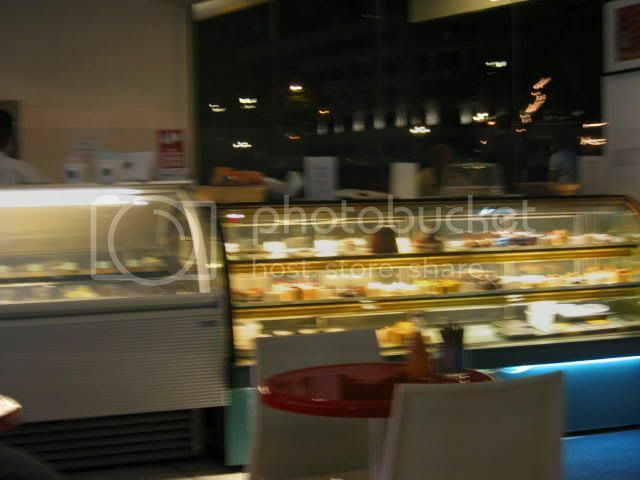 Such was the case with Il Gladiatore, the updated and revamped Fuenti at UE Square. I had high hopes due to a review in the Business Times, and the fact that the guy on the telephone I spoke to while making reservations had the best manners I have ever come across in the restaurant industry. His politeness, reassurance, flexibility and geniality were such that I was determined to give the restaurant a try after having had to cancel the first reservation I made a month ago. Unfortunately, my high hopes were not to be borne out by my experience there. The first problem was one of location. UE Square is, we discovered, comprised of more than one building, and Il Gladiatore is hidden away in a remote corner, so it was quite a while before we managed to find ourselves in the right place. The next was decor. I tend to be a bit suspicious of places based on themes, especially if those themes involve strange costumes and period architecture. Also, if the restaurant started as something else but is now repackaging itself, that's not a good sign either. Il Gladiatore, if it isn't obvious enough, bills itself as a restaurant serving ancient Roman food, and requires its staff to look the part. I wonder if the chefs have to dress as Romans too. Still, I tried to give it the benefit of the doubt. 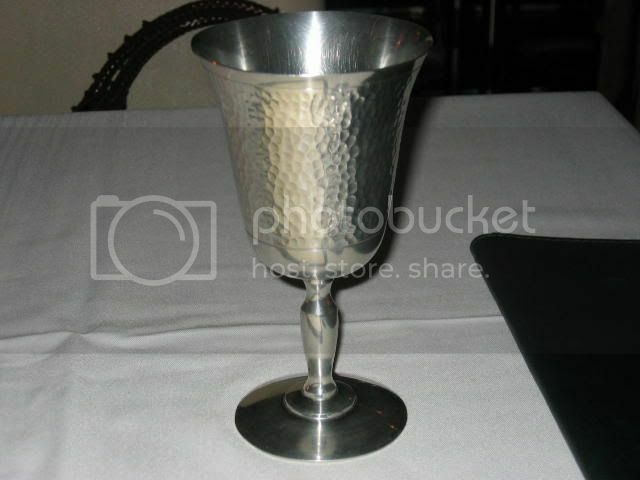 I did think the metal chalices used as water glasses were quite cute though. True to the Roman theme, there was even a housefly that landed on my cousin's cup. A+ for historical authenticity, but D- for hygiene and cleanliness. The other problem is consistency. It's quite difficult to imagine that you're in a Roman amphitheatre when above you there are exposed air-conditioning risers and vents. I think that overall, they might have been better served with a more modern look. 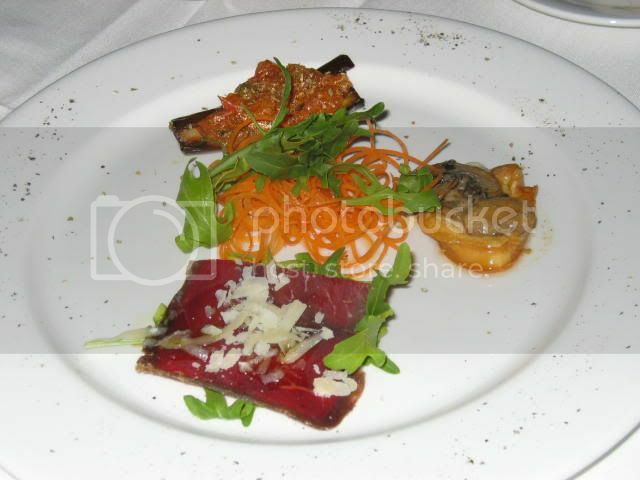 Our starter was strange, because although it was supposed to be a mixed plate of carpaccio, eggplant and something else ($18), those ingredients occupied perhaps half the plate, not at all enough to share between three people. Stranger still, a portion of veal tripe and sauteed mushrooms arrived a bit later, apparently part of the starter, though none of us recalled seeing that on the menu. The veal tripe was rather spicy, and not exactly my thing, but the mushrooms were adequate, if uninspired. I had a pasta (fettucine?) 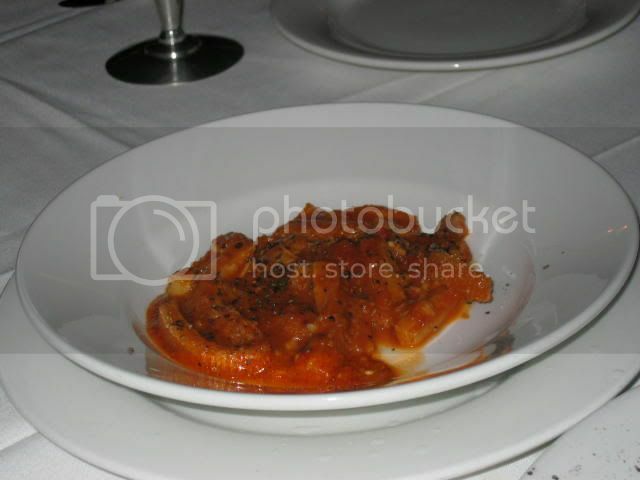 in a bolognese ragu ($18), which was quite enjoyable, though in a somewhat petite portion. It took half an hour to arrive though, which is inexcusable given that the restaurant wasn't very full and it was already 10pm. Unfortunately, my poor cousin ordered spaghetti with clams in white wine (ordinarily called Vongole, but Il Gladiatore lists all their items in Latin), which she valiantly, though ultimately unsuccessfully, tried to finish. It was swimming in oil and apparently the pasta was undercooked. She didn't send it back, but she did take some of my sister's pasta. Now, what should a restaurant do in a situation like this, when a customer has left a significant amount of food unfinished? 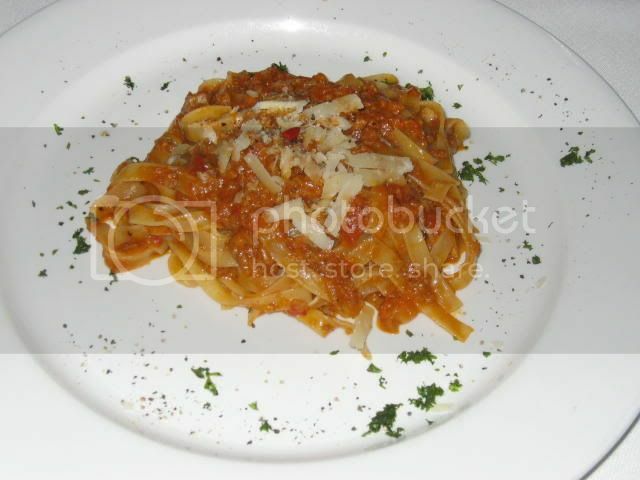 To their credit, the waitstaff did inquire about the unfinished pasta, and when informed of the reason, quickly apologised, removed the offending dish and told us the chef would be preparing something else to replace the pasta. This though, is where good service, if not tailored to the circumstances, quickly becomes bad service. As my cousin had already eaten some of my sister's pasta, and it was quite late, we were already full enough, and desired to leave shortly. So we declined the waiter's offer of a substitute dish. Five minutes later, he started laying out new cutlery, telling us that the chef was preparing something for us, which prompted us to again state that we were done with dinner, and request the bill. Five minutes after, he again wanted to lay out cutlery, saying that the chef was doing something very quickly. While one offer of a replacement dish is mandatory, two is pushy, and three is certainly unacceptable, no matter how good intentions may be. 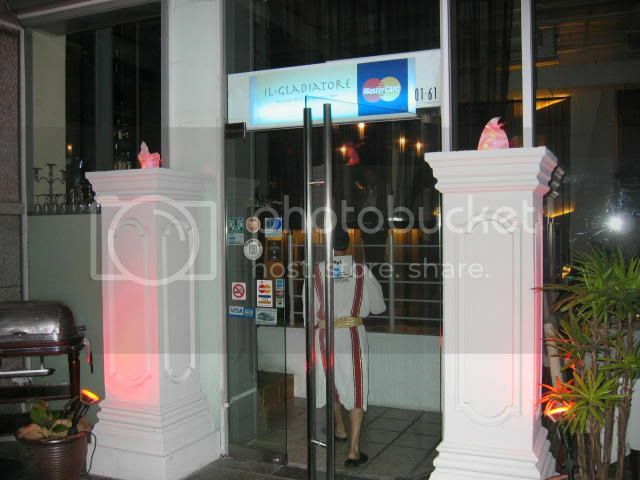 We were forced to decline once again, very firmly and categorically, pay the bill and leave immediately. A $30 voucher was given to us by way of apology, but I have a feeling it will definitely not be used. At least, not by us. 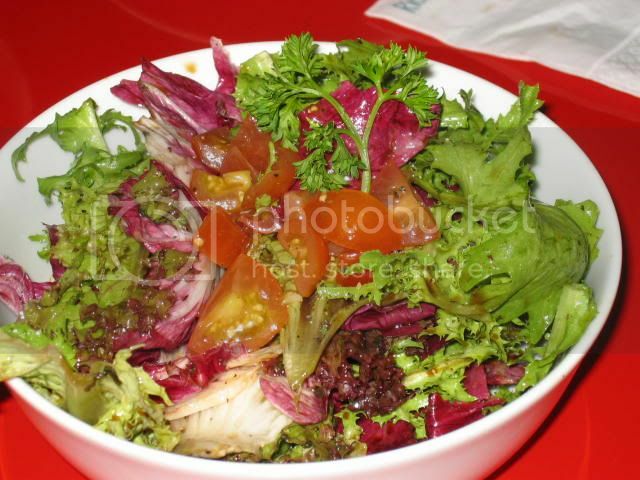 Il Gladiatore's location is not particularly convenient, as no MRT lines serve that area. Also, UE Square is large and disjointed, so there may be some problems locating the restaurant itself. Ambience is kitsch, definitely, though it does have some novelty appeal. 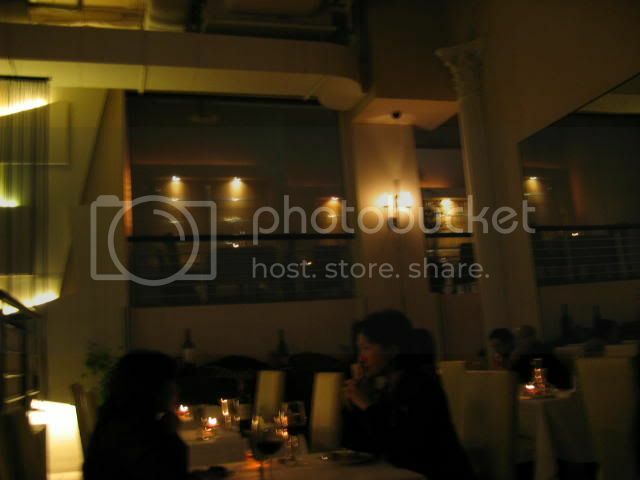 Partly due to a small crowd that night, the restaurant felt very discreet, making me decide to switch my phone to vibrate. Service is particularly difficult to rate for this one. Food was slow in arriving, so that was a problem, but how they tried to remedy the bad pasta is a little less clear-cut. I'm loath to describe it as bad service as such, but as the road to hell is paved with good intentions, I cannot classify it as good service either. Overall: Il Gladiatore seems destined to go the way of the Roman Empire, into the dust of oblivion, though without the glory. Since I've been spending a lot of time at home recently, I tend to tune in to Discovery Travel and Living at lunchtime, so I've been watching a lot of Jamie Oliver. The other day I saw him whip up these "Elvis Burgers", and since I'm a sucker for burgers, I thought I'd try my hand at them too. Found the recipe here. 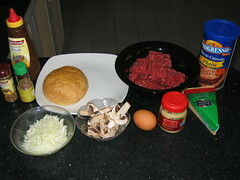 Notes on ingredients: The mushrooms, sliced cheese and vegetables are optional, but in my opinion are worthwhile additions to a burger if you have them. Jamie says he likes to mince his own beef, but I can't be bothered - I just buy mine. 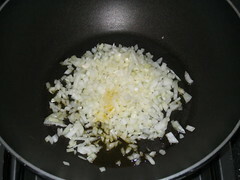 In a saucepan, heat the olive oil and fry the chopped onions over low heat till they soften. I suppose you could add sugar and caramelise them, but that's additional time and trouble. 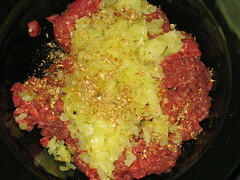 Add the onions to your meat. 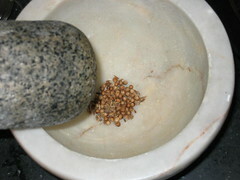 In a pestle and mortar, bash up the cumin and coriander seeds. Just crush them by rolling your pestle, releasing their fragrance and then pummel them till they're a fine powder. Add these, and the salt and pepper, to your meat. Starting to look more and more appetising already. 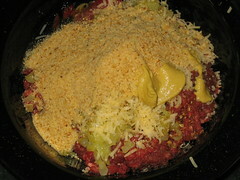 Add the grated parmesan, Dijon mustard, worcestershire sauce, egg and 1/2 the bread crumbs and mix. If too sticky, add a few more bread crumbs. Now, a problem with hamburger patties is that they can get quite dry. 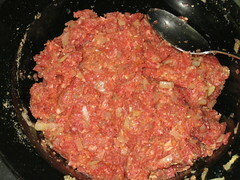 To counteract this, I find it useful to add 2 Tbsp of milk or red wine to make the patties juicier. Purely optional though. 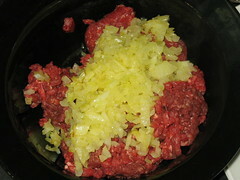 Your patty mixture should look like very interesting dogfood once you've mixed everything together. I bet all you burger eaters never really thought about what goes into your burgers. 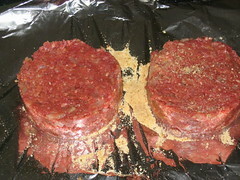 Lay out some greaseproof paper, sprinkle with bread crumbs, and then shape the meat into patties. Place them on the crumbs, and sprinkle more crumbs on top. I used some metal rings to shape my patties, they're dead useful. Be sure not to make your patties too thick though, or they'll be a pain to cook. About half an inch is good. 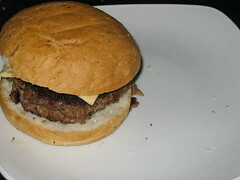 Jamie says these burgers are better if they are chilled in the fridge for about 1 hour before you cook them. 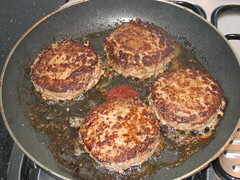 Heat a little oil in a frying pan, and cook the burgers on a medium-high heat for about 8 to 10 minutes, or until cooked to your desire, turning occasionally. You can also fry the sliced mushrooms in the same oil till they're golden brown. Place your patty on the bun, then the sliced vegetables, then the mushrooms, then the cheese, and place the round bun on top of everything. Let it rest a minute for the juices to redistribute, then have yourself a sloppy, mouth-watering burger that will shame fast food outlets everywhere.